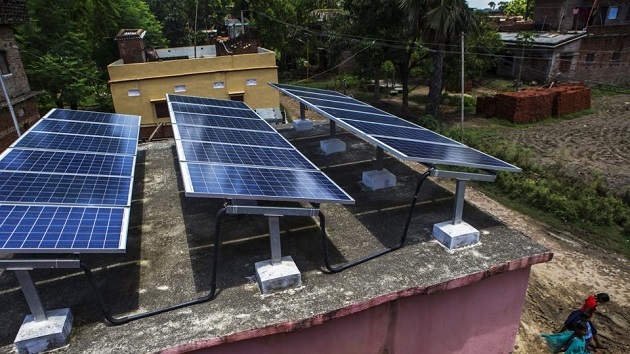 With a potential of 1,730 MW power generation through rooftop solar panels, Hyderabad can become solar champion in India, thereby reduce air pollution by cutting on coal-based power, according to a study. The study, jointly undertaken by Greenpeace India and Gujarat Energy Research and Management Institute (GERMI), stated that if achieved, Hyderabad can reduce its power demand by almost 15 per cent. “A big share of this (1,730 MW), nearly 70 per cent, can come from the residential sector… For residents, solar makes for a solid investment, and would cut down on electricity bills considerably,” said the report ‘Rooftop Revolution: Unleashing Hyderabad’s Rooftop Potential’. The study scanned the area in Greater Hyderabad Municipal Corporation (GHMC) and estimates an average of 2.70 MW per sq. km. can easily be generated through installing rooftop solar panels. “The city is blessed with quite a few major landmarks that have sizable potential for rooftop solar power generation,” the report said. Some of the major regions with huge solar rooftop potentioan according to the study includes, buildings of Osmania University (over 5,100 KW), Begumpet and Rajiv Gandhi International Airports (over 700 KW), the city’s railway stations (3,187 KW), metro stations(679 KW), all bus depots (nearly 3,000 KW). According to records, Hyderabad has the highest annual Particulate Matter (PM) levels of Telangana’s 11 districts and cities. “Switching to solar will not only help Hyderabad reduce air pollution by bringing down its dependence on coal as a source of power, but also help policy makers to the India’s overall rooftop solar goal of 40 GW by 2022,” said Pujarini Sen, Climate and Energy Campaigner, Greenpeace India. According to Akhilesh Magal, Head, Advisory, Renewable Energy, Environment and Energy Efficiency, GERMI while Telangana already has a rooftop solar policy what’s required is a goal to help determine a market size. As of December 2017, only six out of 29 states and seven Union Territories are complying with the Central government’s Renewable Energy Purchase Obligation (RPO) targets. Telangana has 1,868.17 MW of renewable energy installed, which is just 40 per cent of the target, lagging behind Kerala, Tamil Nadu, Karnataka and Andhra Pradesh.